Mumbai: Foreign investors have returned to India’s debt markets after several months of aggressive selling, prompted by falling crude oil prices and the central bank’s move to ease a liquidity squeeze. Foreign institutional investors (FIIs) have bought nearly $1.26 billion in debt over the last nine trading sessions (between 24 October and 5 November) and have been buyers in all sessions except one during this period, according to Bloomberg data. 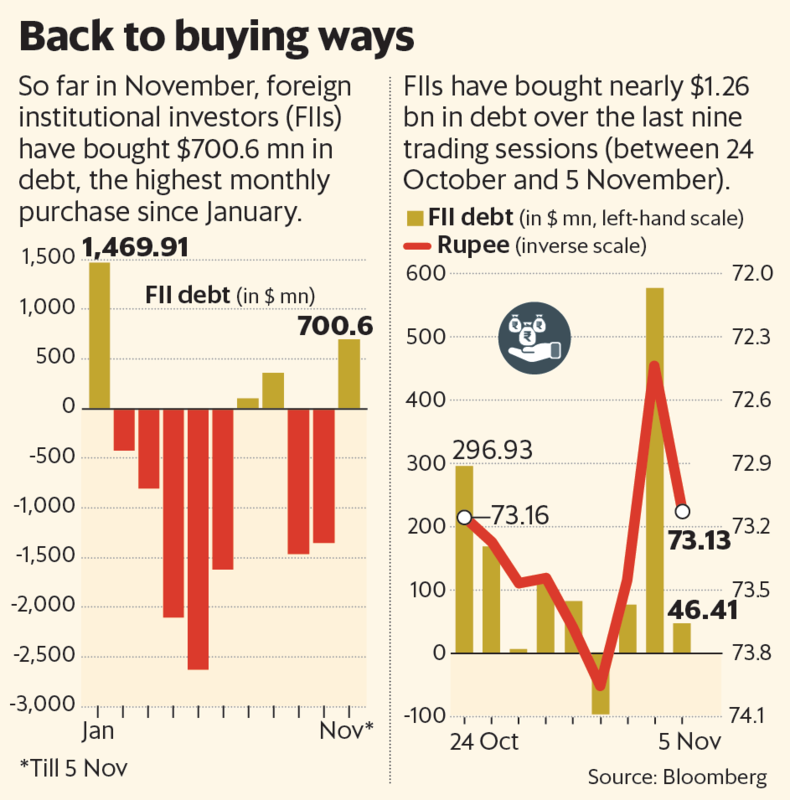 To be sure, FIIs have remained net sellers of Indian debt for the year, offloading $7.76 billion in domestic bonds.So far in November, they have bought $700.6 million in debt, the highest monthly purchase since January. Market experts say FIIs are buoyed by the thaw in the US-China trade war and falling crude oil prices. These developments helped improve investment sentiment for emerging markets, including India, said a report by Kotak Institutional Equities. The drop in crude oil prices has reduced the fear of higher inflation and a consequent fiscal slippage. Consumer price inflation has fallen for the fourth consecutive month, with the next inflation data for October due on 12 November. According to Bloomberg estimates, inflation measured by the consumer price index (CPI) for October is pegged at 3.6%, down from 3.77% a month ago. Brent crude oil, which crossed $86 a barrel in October for the first time in nearly four years, now trades at a near three-month low, just below $73. The international benchmark has lost nearly 16% in the past one month. Kotak Institutional Equities also expects India’s currency and interest rates to be stable if oil prices remain around $75 per barrel. “The rupee seems to be in a fair zone, consumer price index (CPI) inflation comfortable with future trajectory precluding higher repo rates and fiscal position will become more manageable without potential auto fuel subsidies," the Kotak report added. After hitting a record low of 74.48 against the dollar on 11 October, the rupee has stabilized and appreciated 2% since then. So far this year, the Indian currency has weakened 12.5% against the dollar. On the other hand, the yield on the 10-year benchmark bond was at a four-year high of 8.11% on 4 October, but has since declined over 30 basis points to close at 7.799% on Tuesday. “Reversal in FPI (foreign portfolio investor) flows has mostly been caused by strengthening emerging market (EM) currencies, attractive rates, the fall in oil price and the flat yield curve in India. This is more of a reversal in trend than in the cycle and volatility of flows will be the new normal," said Soumyajit Niyogi, associate director, India Ratings and Research. That apart, the Reserve Bank of India’s continued liquidity support through a series of open market operations (OMOs) has helped calm the bond markets, bringing down bond yields. In October, it announced ₹ 36,000 crore of OMO purchases and met its target in three tranches throughout the month. RBI has announced ₹ 40,000 crore of purchases through the same route in November. RBI’s monetary policy panel has also decided to adopt a neutral liquidity stance. Under this, RBI aims to keep call money rates closer to the repo rate. Signs of stability in the rupee and the ebbing of global triggers (particularly oil) have drawn FPIs back to the Indian debt markets, according to Radhika Rao, an economist at DBS Bank Ltd. “The premium on policy tightening risks has also reduced after the central bank kept rates on hold last month and softer inflation profile lowers the odds for a move in December," Rao said in an email from Singapore. The trend has, however, not reversed in equity markets, where FIIs have sold nearly $5.64 billion since January. Between 24 October and 5 November, they were net sellers of $1.01 billion.